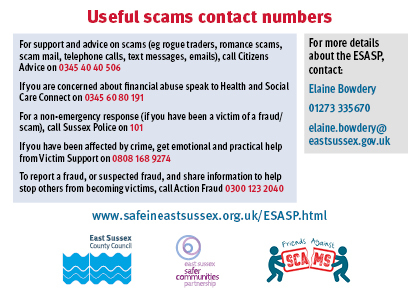 The East Sussex Against Scams Partnership (ESASP) is a county-wide project helping to protect residents against scams and fraud by raising awareness with them about the different types of scams. It is a partnership of organisations - businesses, charities, church groups, clubs, community enterprises, councils, societies, voluntary groups and other partners - all committed to taking a stand against scams with the aim of making East Sussex a scam-free county. Please "sign up" too! Scams are fraud and fraud is a crime. We should report them to Action Fraud, not ignore them. Each year scams cost the UK economy between £5bn-£10bn. In addition to the financial impact, scams can have a severe emotional and psychological impact upon victims. Anyone can be a victim irrespective of age, gender, education or economic background. Being a victim of this crime can have devastating impacts upon people. These crimes are targeted at people in our communities who are vulnerable for a variety of reasons, including poverty, isolation, frailty, cognitive impairment, and because they are specifically targeted by organised predatory criminals. (3) Find improved ways of identifying and recording scams via Action Fraud so there is a clearer understanding of the true scale and impact of scams upon our residents. • Running Friends Against Scams awareness raising sessions for staff, family and friends, members and volunteers. For further details, visit www.friendsagainstscams.org.uk). Please note: these sessions are complementary to East Sussex County Council safeguarding awareness and training procedures which should always be followed. If unclear about any aspects of safeguarding in relation to these sessions, please contact Health and Social Care Connect on telephone no. 0345 60 80 191 to discuss. Through these actions, Charter partners will help protect their customers, staff, members, volunteers, the general public, neighbours, friends and family from being targeted by criminals; it will help them meet their corporate social responsibilities; and there may be opportunities for networking with other like-minded organisations. If you would be interested in signing up to the Charter, please ring the Safer East Sussex Team on 01323 466549.